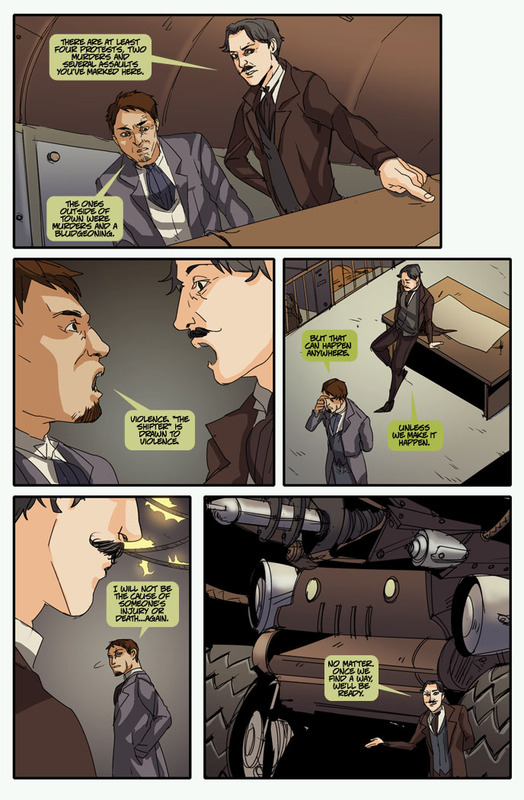 Tesla and Samuel discover something very interesting about “The Shifter” on this new page. Take a look and let me know what you think. The numbers have been crunched and the incentives almost worked out. (Just some final touches here and there.) We will be aiming to fund the printing of the third issue which will not only contain the complete third chapter, but also six (6) extra pages of bonus material for a total of 28 pages!! Next week I have to go do my little video portion, but it looks like we will launch the week of Jan. 20th. The exact date depends on how long it takes Kickstarter to approve everything, but I’ll let you know! YAy I am all caught up! Now I can RSS this and follow it as updates occur! I’ve very much enjoyed this comic to point! Great! Or you can subscribe to the blog. 🙂 Whatever works for you. BTW, the Kickstarter will re-launch in two weeks so stay tuned! !